Skin Cancer / Skin Aging Alert: Spending time in the sun increases your risk of skin cancer and early skin aging. This product has been shown only to help prevent sunburn, not skin cancer or early skin aging. on damaged or broken skin. keep out of eyes. Rinse with water to remove. Apply liberally and evenly 15 minutes before sun exposure. Use a water resistant sunscreen if swimming or sweating. Children under 6 months of age: Ask a doctor. Apply using the sponge and cover the face evenly. Blend softly with the applicator or, if you prefer, your fingertips. Isostearyl Neopentanoate, Mica, C12-15 Alkyl Benzoate, Ethylhexyl Palmitate, Polymethyl Methacrylate, Dimethicone/Vinyl Dimethicone Crosspolymer, Ozokerite, Kaolin, Polyethylene, Copernicia Cerifera Cera (Copernicia Cerifera (Carnauba) Wax), Zea Mays Starch (Zea Mays (Corn) Starch), Kojic Dipalmitate, Phenoxyethanol, Dimethicone, Octyldodecanol, Glyceryl Isostearate, Isostearyl Alcohol, Methylparaben, Silica, Butyrospermum Parkii Butter (Butyrospermum Parkii (Shea) Butter), Microcristallina Cera (Microcrystalline Wax), Propylparaben, Beta-Sitosterol, Parfum (Fragrance), Candelilla Cera (Euphorbia Cerifera (Candelilla) Wax), Trimethylsiloxysilicate, Petrolatum, Phospholipids, Bht, Glycyrrhiza Glabra Root Extract (Glycyrrhiza Glabra (Licorice) Root Extract), Butylparaben, Ethylparaben, Cholesterol, Isobutylparaben, Cera Alba (Beeswax), Cetearyl Alcohol, Cetearyl Glucoside, Polyglyceryl-2 Dipolyhydroxystearate, Glycosphingolipids. 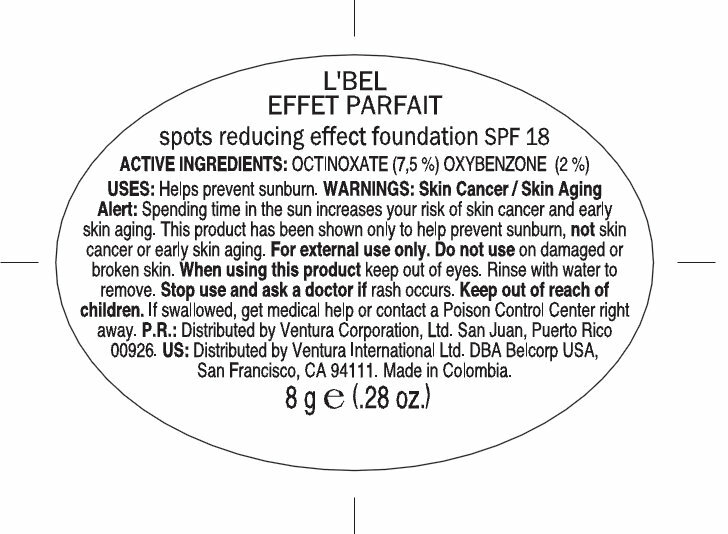 L'BEL presents its Effet Parfait line to maximize your skin's beauty. An innovative line of perfecting makeup that adds luminosity to the face and gives it a youthful appearance thanks to the latest concept in cosmetic technology: Perfecting Technology. 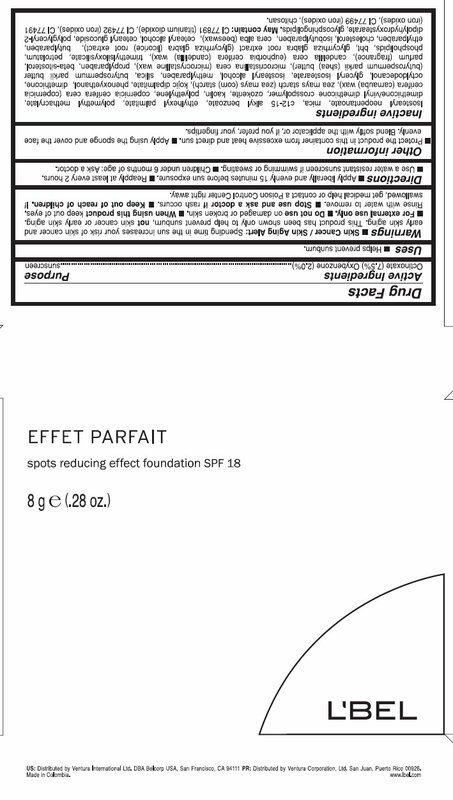 Effet Parfait products transform the appearance of your face, returning the healthy look and glow of youth. In addition to concealing and correcting imperfections, they prepare your skin for applying makeup shades and express your skin's maximum beauty and splendor. A foundation with coverage that adapts to the needs of your face. With continual use, its innovative Photo Bright Complex technology helps diminish existing spots and, thanks to its photoadjustable pigments, evens out skin tone and conceals dark areas and surfaces more effectively, minimizing the intensity o spots and imperfections immediately. The result: uniform, natural and youthful skin. WARNINGS: Skin Cancer / Skin Aging Alert: Spending time in the sun increases your risk of skin cancer and early skin aging. This product has been shown only to help prevent sunburn, not skin cancer or early skin aging. For external use only. Do not use on damaged or broken skin. When using this product keep out of eyes. Rinse with water to remove. Stop use and ask a doctor if rash occurs. Keep out of reach of children. If swallowed, get medical help or contact a Poison Control Center right away. Use in the morning after cleansing and toning. Apply small amounts using the fingertips and spreading with upward, circular movements. Rub gently until absorbed completely. Protect the product int his container from excessive heat and direct sun. Step 1: Apply the Perfect Face Effect Retexturizing Gel. Step 2: Apply the Effet Parfait foundation that best meets your skin's needs. Step 3: Apply the Rejuvenating Effect Concealer.